The first month of 2014 is in its third week. And right on cue, I am posting now despite having all the intentions of posting my first post before the first week! One thing that comes back to bite me over and over again is the glaring fact that occasions hardly mean anything to me. I cannot commemorate a date (unless it happens to be Amma’s birthday) or something like India hosting the Olympics or something. I mean it has to be really big! I’ve not been good with having and sticking to a schedule! hello, I couldn’t even post when I announced an event on my own blog! The old year finally rolled out. I swear am not going to revisit the tumultuous time. If you are interested in a really verbose story, you can read all about it in my other blog. For this year, I have no grand plans or schemes. I just want honest and simple blogging. To share a piece of my story, or a mundane routine, or a recipe I tried and liked. I do not know how often I will post, or the quality of my pictures, or when I will finally work through the archive of photographs I have. But whenever I have something I want to say to you, my dearest readers, I will come here and type out… sometimes furiously, sometimes labouring over days to say it. I do not have a card reader slot in my new laptop, it is a royal pain to transfer photographs from my (proper) camera to the blog. I’ve decided to post pictures that I take with my phone till I get that sorted. A low quality picture shouldn’t come in the way of a blog post right? Right! 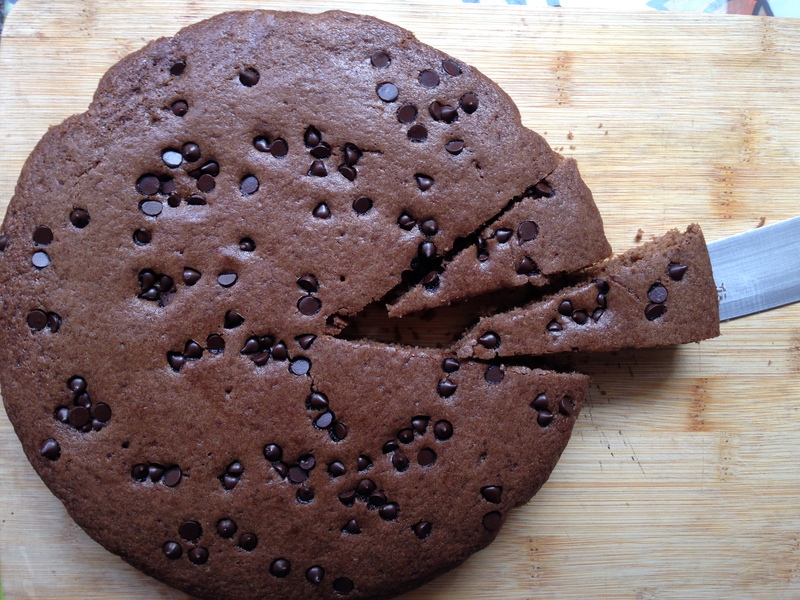 I was chatting (I do that all the time) with my namesake and she sent me a picture of the cake she baked with her son. I had to make it immediately. It was that tempting. In record time, I baked and texted her back a picture with my changes. This is a super easy and wholesome cake. It is not cloyingly sweet and is a good candidate for a douse of chocolate ganache or even icecream. Perfect for those who want a bite of a nice warm piece of homemade cake. In many ways, this cake is so like my life and therefore my blogging. It can be everything you want it to be, dressed up, glammed out and yet, at the core, it remains a solid fall back recipe which anyone can make. It has ingredients you do not have to run out of the house to buy and yet, when the cake is almost baked, the heady aroma whets your appetite and makes you look forward to a generous slice. Preheat the oven to 180C/350F. Line the bottom and sides of a 8″ round cake tin with butter paper and brush with melted butter or neutral vegetable oil. Sift the flour with the cocoa powder, baking powder and salt and set aside. Beat the butter and sugar in a bowl. Add the egg and beat again. Add the milk and vanilla and beat for 30 seconds. Add the sifted flour mixture and mix gently with a spoon or a spatula, until well incorporated. Add the choco chips and mix, reserving a few to sprinkle on top. Pour this batter into the prepared cake tin. 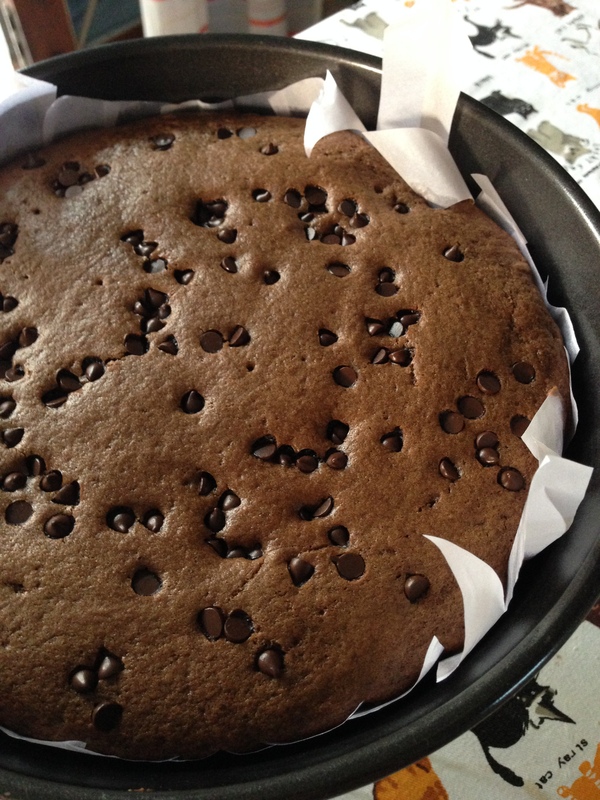 Sprinkle the reserved chocolate chips on the top, give the cake pan 1-2 sharp raps on the counter top to settle the batter. Bake for 24-26 minutes or until a skewer inserted into the cake comes out clean. Transfer the cake to a cooling rack and cut into 9-12 wedges. The cake that is leftover can be stored in an airtight box at room temperature for 2-3 days. If storing longer, refrigerate. Serve as is, with a dollop of vanilla ice-cream or a douse of chocolate sauce. YOu have another blog? How come I didn’t know about this? I love cakes like this and yours look so good. A chocolate cake will never get boring… This is simply yum! !